When it comes to improving your home, there are a few small things you can do—such as building a fresh and inspiring bookshelf. Few things add as much character to a home as the right bookshelf. It’s a personal statement about you as a person.If you consider yourself a reader, a bookworm who views a collection of books as something to treasure, then chances are that you won’t be satisfied by discarding your book collection down on just any old available shelf. 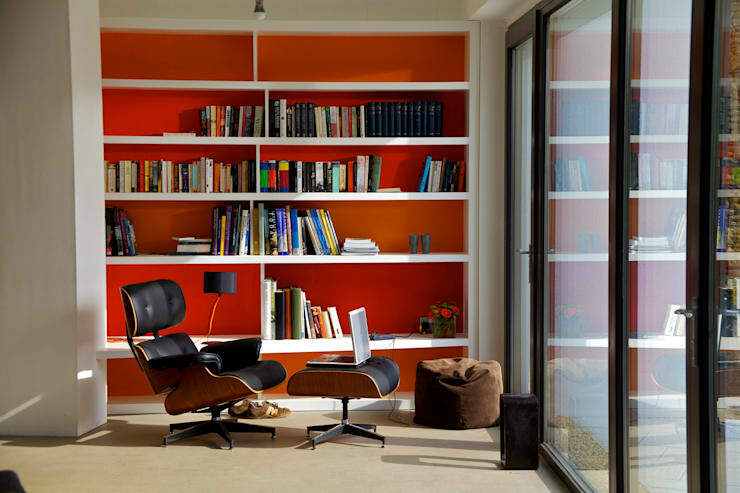 Today on homify we are treating the bookworms and examining six different bookshelves, each one as unique as the next. Although the main point of them all is to house an array of books, their styles reflect different personalities – just as the bookshelf you add to your home will say a lot about you. From big to small, we now take a look at a more compact approach to stacking and showcasing your books. But whoever said that compact needed to be miniature? With this fantastic example of wall-mounted boxes (pictured), you can go as small (or big, or wide, or tall) as you wish. Choose the area where you want to add your bookcase, then start planning the design you want for your shelves (or just wing it – it is up to you). Just look at the clever ways the designer incorporated spaces between the shelves, leaving adequate space for additional decor, plus some breathing room. 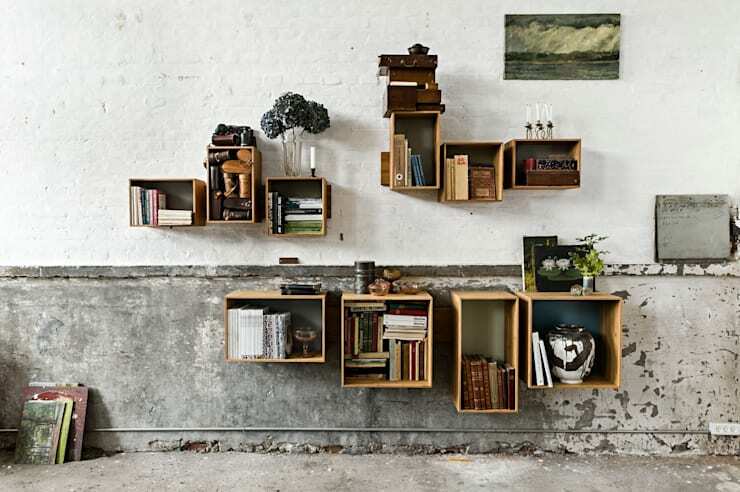 With this smart little bookcase(s), you have the power to create your bookshelves whichever way you want! •	Add some splashes of different colours (or wallpapers) in the spaces behind the shelves to bring some excitement to your reading material. •	Consider hanging your book boxes in the form of a letter (for example, the first letter of your name) for a personal touch! If classic decor is parallel with your choice of interior tastes, then a traditional bookcase might be what you’re after. But don’t confuse “traditional” with “boring”, or conjure up images of dusty old libraries. On the contrary, a traditional bookcase (if done correctly) can certainly turn up the elegance factor in any room of a house. Pictured above is a traditional bookcase in a soft and serene off-white hue. Fitting in just perfectly with the light couch, the bookcase proudly boasts adequate shelving space that is sure to please any bookworm looking to add a soft touch to their library. And the days where bookshelves had to contain nothing but books are long gone – framed photographs, flowers, trophies and other decor add a great personal touch to a bookcase, as is evident in our accompanying image. Now we go for a more modern approach, and the Italian masterminds of Piarotto are just the bunch to show us an example of what a contemporary bookshelf looks like. 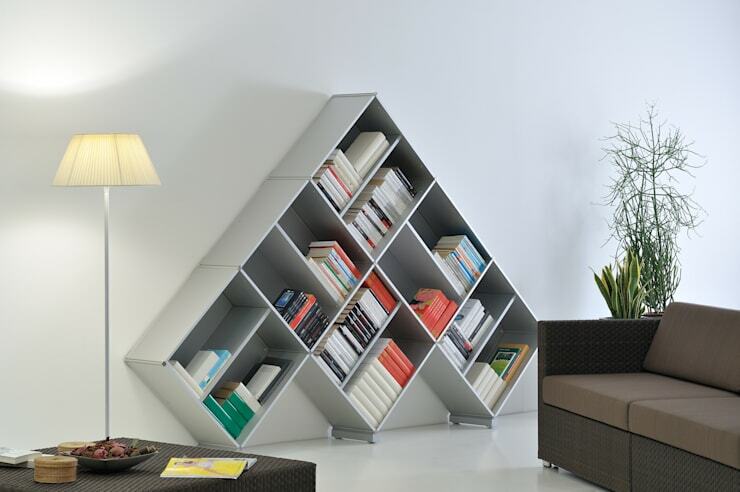 Turning the idea of a bookshelf on its head (or at least its side), this pyramid design adds a distinctive touch to any room. Whether placed in a home, office, home office, or library, this modern design is sure to make anybody notice (and do a double take at) your bookcase! With its superior finishes, soft and calm tone, and modern (almost futuristic) look, this creation is a prime example of what class mixed with ultra modernity can look like. And how to stack the books? Completely up to you! However, seeing as this contemporary creation is all diagonal, it might be wise to lose the decor items mentioned in the contemporary section and only stick with books. As a splash of colour can add a touch of excitement to your interior, why not consider using your bookcase? As they tend to be quite big and, therefore, one of the main focal points of the room, visitors’ eyes will immediately be drawn to them. When incorporating some colour to your bookshelves, be sure to keep some space (about one-third) free on each shelf – especially when you’re painting the back of the shelves / wall behind them. This will allow the colour to stand out more. See how well these warm colours (pictured) work with the crisp white shelves, delightfully clashing in a fun way. As already stated, you can mix things up by alternating your books with different decor objects. Tip: incorporate the changing of the seasons into your bookcase. 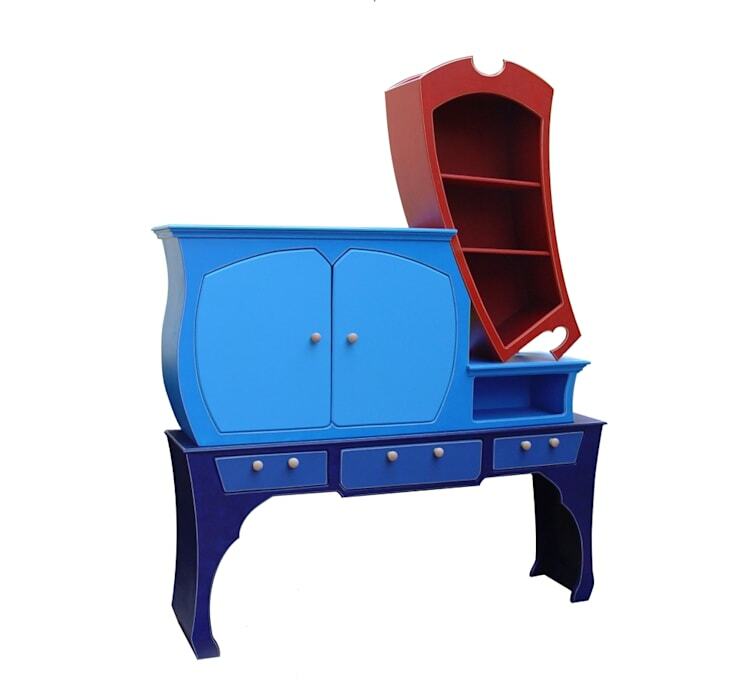 Go for a hot red background in winter, then cool down with a serene blue/green when spring arrives. If big, sturdy bookcases that cover an entire wall are your thing, it is your right and privilege to add them to your house – but be smart about it! The last thing you want your bookcase to remind people of is the school library – even if you have your own library in your house. •	Add some diagonal lines in your bookshelf (as is shown in the accompanying image, this adds a unique touch to any bookshelf). Would you like some more inspiration for your bookcase? Take a look at these decorating tips for your study/office. Can’t decide which look to go for? Why not try an “otherworldly” style and go eclectic? Mixing and matching styles is what eclectic is all about, but you don’t need to go Baroque vs. hot-pink spray-paint to achieve that. What about bringing Wonderland into your study with these fantastically crazy creations by Raxfox Design? Bended, brightly coloured, and looking as if they’re ready to start bouncing all over the place, these bookcases will be equally successful displaying either a child’s book collection, or housing the reading material of a young-at-heart professional looking to add some bright fun to his study. Don’t like the bright colours? Then opt for a more “adult” look with crisp white, warm beige, or whatever hues you desire. Call it crazy, call it kooky but this unique look is certain to add a memorable touch to any room. Feast your eyes on Creative Bookshelf Storage Solutions for some more tips and tricks when it comes to your books!